THE Telikom National Soccer League Board yesterday officially confirmed eight teams for the 2013 season. Chairman Isaac Lupari (right) announced the teams as Hekari, Eastern Star, PNG Besta, Welgris, Port Moresby, NC Civil Oro, Gigira Laitepo and WNB Tavur. Lupari said all teams would play seven matches each per round and there would be two rounds of competition. After the close of the season, the top four teams qualify for the finals, with the champion team earning the right to represent the country at the 2014 O-League competition. Hekari will represent Papua New Guinea in this year’s O-League, which is expected to start in March. They will be up against Ba (Fiji), Amicale (Vanuatu) and Warriors (Solomons). 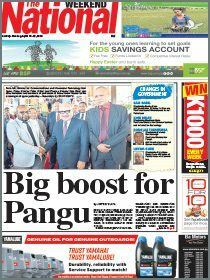 Lupari said this weekend would mark the official kick-off of the 2013 season at the Sir John Guise Stadium, in Port Moresby, by Sports Minister Justin Thatencko at 6pm. He said the stadium would host two matches – Hekari playing FC Port Moresby and Eastern Stars taking on NC Civil Works Oro FC. 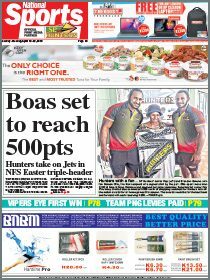 Simultaneously in Lae, Besta will host Mt Hagen-based soccer franchise, Welgris Highlander, while across the Bismark Sea, WNB Tavur FC will play Gigira Laitepo Morobe United in Kimbe. Lupari said the league would use the Sir John Guise stadium to host matches in Port Moresby but would have option to use the Sir Hubert Murray Stadium when facilities for the 2015 Pacific Games in Port Moresby are upgraded. Hekari franchise owner John Kapi Natto expressed disappointment with the league administration for not making an attempt to talk to the Port Moresby Rugby League Board (POMRFL) for the use of their facilities. “Lloyd Robson Oval is a premier stadium and which is more suitable to host national and international football matches such as National Soccer League (NSL) and O-League,” he said. Kapi Natto said Hekari had an understanding with the POMRFL board and had declared the PRL Oval as their home ground. “We will only play away matches in Port Moresby at Sir John Guise stadium but all our home matches will be played at Lloyd Robson Oval (PRL) oval,” he said. Kapi Natto appealed to the NSL management to revisit their decision and meet with POMRFL board for the use of Lloyd Robson Oval for NSL and O-League matches.